Palin's attacks on Obama have turned to the subject of Iraq. CINCINNATI, Ohio (CNN) - After a week of hammering Barack Obama over his ties to former radical William Ayers, Sarah Palin opened up a new line of attack Friday by questioning Obama’s patriotism, citing a newspaper report that the Illinois senator negotiated with Iraqi officials this summer to stall a White House agreement on a timeline for troop withdrawals from the country. “We’ve learned that Barack Obama tried to influence negotiations with Iraqi leaders in a way that would set back America's cause there, while advancing his campaign here,” Palin said at a morning fundraiser in the upscale Cincinnati suburb of Indian Hill. Palin was referring to a Washington Times report Friday that said Obama privately pushed Iraqi officials in June to delay negotiating a long-term “status of forces agreement” until the new president enters the White House, a move that would appear to step on the Bush administration, which was in the midst of negotiating its own agreement. According to the article, the Obama campaign insisted the Democratic nominee was negotiating in his capacity as a senator, and that he believes Congress should have input on negotiations over troop reductions. 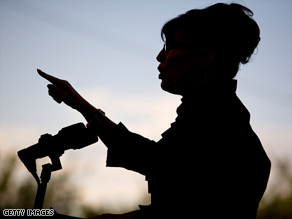 Palin accused Obama of presumptuously meddling in the affairs of a sitting president, at the expense of U.S. troops. "Obama apparently tried to undermine our government's official efforts to reduce troops in Iraq,” she said. “If this is a true, again, it is a stunning example of putting ambition above country. To put political ambitions in front of doing what's right for our troops is breathtaking and it is unacceptable." “I pray to God that people have enough time to let this register with them and start again, connecting the dots and understand the contrast between the tickets,” Palin said. Sarah, please talk about something that matters. My 401k, has turned into just a 40, and tomorrow I'm afraid it will be just a 4. People want solutions, not mud slinging!! On the contrary, Gov. Palin, it is you who have put ambition before your family and thus your country. The American family is the keystone of the integrity of this nation. Lady, you have failed miserably to be true to anything. Look who's talking??? A mother with an infant special needs child, a teenage daughter on the verge of motherhood, another young daugher. I mean, not judging her situation, I am a multi-task mother also. But please, give me a break, here. And she doesn't use Alaska for her OWN ambitions???? AIP ring a bell???? Again, they can't win on the issues, so their resorting to fear, hatred and smear. Palin is an idiot!!! And John McCain's judgment has proven to be terribly flawed in his choice of her. Don't get me wrong, I like Senator McCain, but I cannot in clear conscious vote for him knowing that Palin could be president if something happened to McCain. Also his line of attack turns my stomach. As much as I hate to say this, Obama now has my vote. Can somebody stop her. She is too annoying. And that is Senator Obama to you Sarah!!! You are a liar for sure, but at least be a polite liar!!! Wow, if this is true then this is HORRIBLE!!! How dare a Senator try and persuade a foreign gov't to side with him rather than in the best interest of our country. For those of you saying this is alright, then let's put the shoes on the other foot. Let's say Obama is President and a Republican Senator talks behind his back when he's negotiating a peace treaty between Georgia and Russia. YOU WOULD BE FURIOUS!!!! Obama is putting his presidential desires ahead of the country's needs. Horrible decision Obama. This just may cost you the election! Now THAT is totally the pot calling the kettle black. I wish Palin could spend some time talking about how she can make a positive change in our country rather than throwing barb after barb at her opponents. She is truly a woman without ethics and it's a shame that she's one of the few that have made it to her level in politics. Sarah, you have put YOUR AMBITION ahead of YOUR FAMILY! They are a disfunctional mess and you don't even seem to notice. Sorry to dissappoint you all, but Barrack Obama is no political messiah and he has A LOT to answer for. Shrugging off difficult questions and flowery speech just doesn't cut it. Who is Barrack Obama? What are his plans for this great nation? Hopefully we'll find out in the next debate and/or within the next couple of weeks. After the report coming out later on how you abused your position and governor and mayor, NO one will be listening to you anymore...as if they even do now...bu bye failin!!!! OMG!! T his coming from a woman who is putting herself first over her poor children who need a mother. Sarah Palin is a power hungry fake that must hate this country. Here is a woman that advocated for Alaska succeeding from the United States along with her husband Todd. This is a very evil woman and the sooner she is off the political stage the better for the country.